A 1913 edition of an encyclopedia of education noted that recent studies of that period “amply demonstrated” that myopia was an inherited condition. The encyclopedia cited and recommended the research work of Karl Pearson as one of the authorities on the matter. Pearson was the English mathematician who is renowned for establishing the modern discipline of statistics and the correlation coefficient that bears his name. 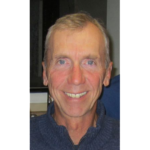 Pearson’s cited research work was a co-authored report that relied on secondary vision science statistics for hereditary relationships. The trouble was, the previously documented data were scant and of questionable value in many respects. The report fully admitted this difficulty and stressed that their work was simply a first study into the relationship between genetics and myopia. Nevertheless, Pearson and his co-author forged ahead and attempted to show a good correlation between genetics and myopia, glossing over the actual weak correlation. That’s because their main agenda was eugenics. Defective physique including defective powers of sensation are we know closely correlated with defective mentality, they are both signs of an ultimate physical degeneracy….. The first thing is good stock, and the second thing is good stock, and the third thing is good stock, and when you have paid attention to these three things, fit environment will keep your material in good condition. No environmental or educational grindstone is of service, unless the tool to be ground is of genuine steel—of tough race and tempered stock. To bring home this fact in each department of human physique and mentality seems to be the urgent social problem of to-day. The education encyclopedia made absolutely no mention of such vile eugenics bias and felt that the report demonstrated the futility of myopia prevention measures. As a result, the encyclopedia recommended that school children should have their eyes “tested by competent oculists, fitted with suitable concave lenses, the error of refraction fully corrected …” This is a sordid episode in the history of vision science, particularly when you realize the long term implications of the paradigm shift. It appears that such tainted advice set the stage for the palliative treatment method (optical poison) that persists to this day — prescribing full strength eyeglasses for young myopes as early as possible. Once again, Bates was well ahead of the game, for it took another forty-nine years until other researchers came to these same conclusions. 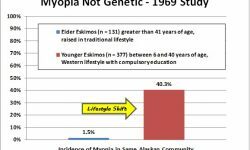 A now famous and frequently cited study in vision science led by Francis Young, a psychology professor and myopia researcher, found a high incidence of myopia among young Alaskan Eskimos who had received Westernized, compulsory education. The elder Eskimos, who had been raised in a traditional lifestyle and hadn’t had such acculturation, were virtually free of nearsightedness. Refer to the graph in Figure 3.1. Genetics couldn’t have caused such a dramatic and sudden shift in visual acuity. 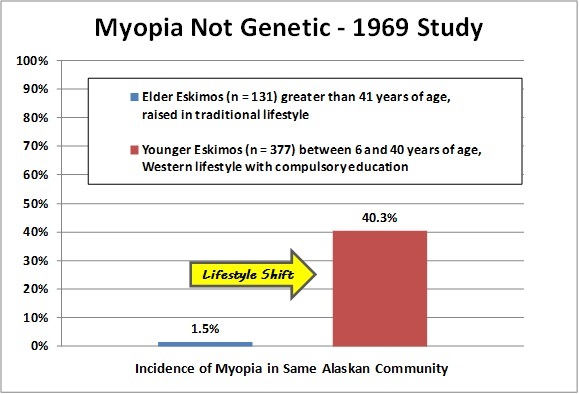 Figure 3.1 A generational shift in lifestyle of Alaskan Eskimos, from traditional to Western with compulsory education, resulted in a huge rise of myopia that could not have been caused by genetics. In 1996, the American Vision Institute, of which Young was a member, provided further evidence that the genetic theory was “bankrupt.” U.S. government statistics showed a steady nationwide myopia incidence rate of 15 percent from about the 1920s to 1950. The rate suddenly rose to 40 percent by 1980. Hereditary factors couldn’t have possibly accounted for the surge in the prevalence of myopia in such a short time span. Although Bates rejected the two opposing theories of excess near work and heredity, he didn’t eliminate the role of nurture. He discovered that myopia was, indeed, an acquired condition, but for reasons previously never considered in vision science. A Cyclopedia of Education, ed. Paul Monroe, (New York: MacMillan, 1913), s.v. “Myopia,” 4:361. Amy Barrington and Karl Pearson, “A First Study of the Inheritance of Vision and of the Relative Influence of Heredity and Environment on Sight,” Eugenics Laboratory Memoirs V, University of London, (London: Dulau & Co., 1909), 37, 48. A Cyclopedia of Education, 4:362. L. Fox, “Examination of Indians at the Government School in Carlisle, Pa., for Acuteness of Vision and Color-Blindness,” Philadelphia Medical Times 12 (February 25, 1882): 346-347. W.H. Bates, The Cure of Imperfect Sight by Treatment Without Glasses, (New York: Central Fixation Publishing Co., 1920), 256. Francis Young, et al., “The Transmission of Refractive Errors Within Eskimo Families,” Am J Optom Arch Am Acad Optom 46, no. 9 (1969): 676-685. The bar chart in Figure 3.1 was created from the data within the source listed in note 7. Stephen M. Beresford, David W. Muris, Merrill J. Allen, and Francis A. Young. Improve Your Vision Without Glasses or Contact Lenses, (New York: A Fireside Book, Simon and Schuster, 1996), 28.